This thesis describes novel methods to localise and estimate the burial depth of subsea cables. The limitation of the current methods is that they can measure the distance to the cable only in a small vicinity, usually up to three metres. The enhancements of the methods were investigated. The output from Neural Network algorithms was tested for its ability to enlarge the detection range and increase its precision. Following traditional methods, a new approach based on system identification and modelling was inspected. Various models were proposed and enhanced with Kalman filtering for linear models and unscented Kalman filtering for nonlinear models. In the case of subsea cable tracking, Kalman filtering requires precise knowledge of the system dynamics and associated stochastic processes. These requirements are often difficult to satisfy. To overcome this limitation this thesis proposes a novel and effective algorithm based on particle filtering. The proposed novel approach uses the whole set of sample points collected from the surface above the subsea cable. 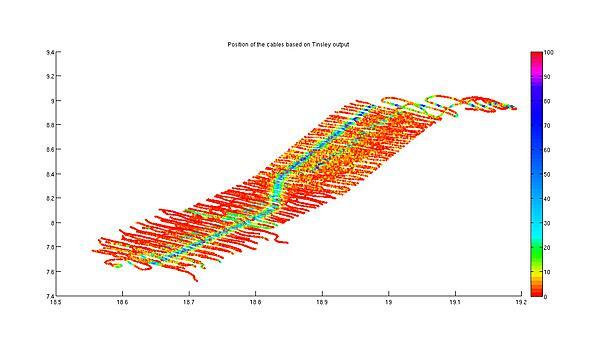 The algorithm based on a batch of samples allows to effectively eliminate the noise of the readings and estimate the position of the cable from larger distances than the current methods can do. The novel batch particle filter was implemented in different applications. Depending on the survey requirements and set-up, the method can be used on a single survey line or applied to the area covered by the survey and estimate the three-dimensional section of the cable. The algorithm was tested in a simulation of tracking by an autonomous surface vehicle. Finally, the market analysis for commercialisation of the method was conducted and a new prototype was proposed. The batch particle filter was tested on experimental data collected in different locations. The results demonstrate that the method is both practical and feasible and can successfully estimate the position of the subsea cable in shallow water.